It’s the time of year when most of us feel like living in sweats and other equally cozy staples. But as part of our personal mission to keep a more conscious closet, we set out to find a brand that paid just as much attention to how ethically and sustainably their clothes were made as they did to how good they fit and feel. Enter Los Angeles-based brand MATE the Label. 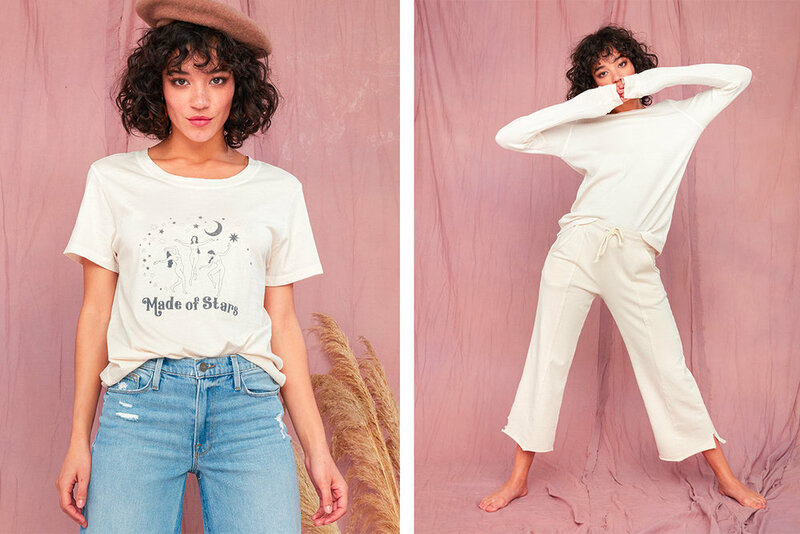 Founded by Kayti O’Connell Carr in 2013, MATE has been committed to offering locally-made, vintage-inspired tees and other broken-in basics since its beginnings, but more recently it has stepped up its position as an environmentally friendly label. In addition to the fact that the manufacturing process creates a lesser carbon footprint by keeping production local, MATE’s pieces are certified by the Global Organic Textile Standard. Considering the coolest girls are currently coveting MATE’s graphic tees, organic thermals, joggers and other perfectly lounge-y pieces, it’s decidedly having a moment — and hopefully that’s an indication that consumers are starting to demand clothing that’s as sustainable as it is stylish. We recently chatted up Carr to discuss both these important facets of her brand, as well as how it’s evolved over the past few years, and what she hopes for the future. Tell us about the process that led up to launching MATE. MATE was born out of my love for vintage, visual story-telling and a need to create something for myself. I started the company by selling vintage t-shirts with no intention of creating my own line, however, it was a natural progression. In the beginning, I was focused on offering a highly curated collection of vintage pieces that were hard to find. I came into this industry with zero experience other than working a couple retail jobs throughout school but have learned that a beginner's mind is very advantageous. When I graduated college, I took an administrative job at a finance firm to pay the bills — the side hustle struggle [to keep MATE going] was real. Building this business has been a multitude of learning curves, failures and just figuring it out as I go. How has MATE evolved since its initial launch? There have been several iterations of the brand since conception. Over time, I have learned that my core value have developed into constantly evolving and educating myself on how to be a better business. Each year this has meant different things; it's freeing to me that I allow my business model to pivot depending on what I feel is most important to our customers and missing in the market. MATE has been known for our vintage-inspired graphic tees as they have been a large part of our business since the beginning. As much as we love designing into this category, we are also focusing our energy on our core group of essentials which we call ‘Dailies.’ I think there is nothing more sustainable than offering clothing that can be worn over and over and over again. In what ways do you stay sustainable? We recently launched our Dress Clean initiative, which I am extremely passionate about and is what truly guides the brand's ethos and vision. We have always been domestically developed and produced; within a 5-mile range of our HQ. Transparency, ethical manufacturing and environmental impact have always been important to me; but there is also another component that I think is missing from fashion's ‘sustainability’ consciousness. That is, fashion's impact on the individual in regards to health. The consumer understands the importance of organic foods, clean beauty products but what about the clothing that you wear everyday? We have committed to using natural GOTS certified organic fabrics and have removed all synthetics from the line. We are also strictly using low-impact dyes. Things like pesticides, endocrine disruptors, and carcinogens are rampant in the industry and I hope to offer the cleanest product possible to our customers. We like to think of our product as skincare for your closet. For MATE, we try to focus on the garment's full life-cycle, from the soil, water, farmers, to the end consumer and so on. A single purchase affects so many different people as well as the environment on many levels. Sustainability is really about understanding that everything is connected. I believe that if sustainable resources are available to my business, it's the right thing to do. It's such a dirty industry and there are options out there to make it better so it feels like a no-brainer. MATE is so quintessentially Californian. Who's your ultimate California style icon? What's your current favorite piece and how are you styling it? The Harper Thermal in Rose and the Tyler Jogger, the perfect set. What are your future goals for the brand? Our short term goal is to start developing into more categories and adding more size offerings; in 2019 we will be launching our first sleep collection. We are also working on developing an educational component to our website where customers can learn more about our Dress Clean initiative. My bigger long term goal is to offer an assortment of organic products for a great price point, as I believe that organic clothing should be accessible to the masses without a steep price tag.